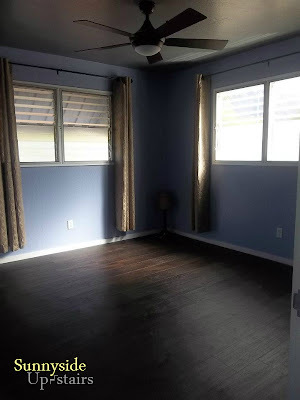 It has been one year and 7 days since we removed the carpet and tacking strips, one year since we repaired our crank jalousie windows in the bedrooms, and painted the trim, walls, and ceilings. Last April, we braved replacing electrical outlets, installing two ceiling fans where there had been none, and removing a ceiling fan where we didn't want one. I expected to complete three kitchen projects this weekend: our kitchen backsplash, ledge shelving, and our second Squared2 Chair, but our plans spontaneously changed. As if propelled to stick to our word, my husband and I cleared out the "Master Bedroom" of all the renovation supplies and relocated tools and leftover material into the poor little Nursery. 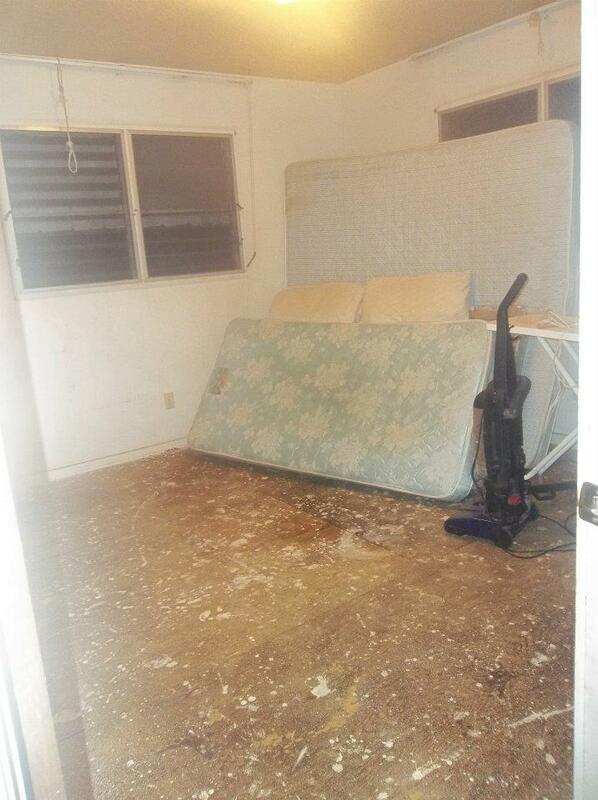 I scrubbed the Master baseboards, having been untouched in there for a year, swept the floor, vacuumed, microfiber mopped, and steam mopped the floor after we removed the king size mattress and box spring. Through multiple tiresome trips up and down the stairs, we moved in our own queen sized bed. Thar she is, uncarpeted, vulnerable, and open to possibilities. In one month, we painted, repaired, hung curtains, and installed a ceiling fan. Almost one year later, we finally moved in a bed. Now, it's atleast a bed room. I won't mind the journey to making it the "Master's" bedroom. May 2012 and finally April 2013. Basically, we have a bed, a temporary desk, and one of our tower fans for the approaching Hawai'i hot season. Although the room is bare save for a closet of clothes and a somewhat made bed, we've begun the moving process, one year in the making. 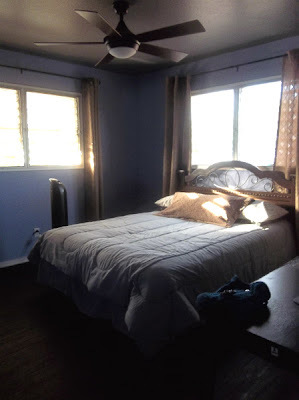 I'm already calculating the furniture we'll build for the bedroom, and the possibility of making a new headboard since our beloved curvy one looked so much better in our old room. We also will be looking for "just right" bedding, which I like to mix and match based on feel and color from Savers. We celebrated quietly, this Sunday night. We ate a dinner my husband prepared from fresh steak and veggies in our now used small refrigerator. We sat on our bed, amazed with how wonderfully comfortable our apartment is. Our bathroom is right outside our bedroom door and the fridge is just about 12 feet from there. Then we passed out, exhausted from the lifting and pushing and trying to get a king sized mattress to exit our small stairwell. Our daughter is still sleeping in her room in my mom's downstairs house, until all the renovations are complete and the apartment is safer for her. Now our entire apartment is a mess of things moving in, and materials moving out, but at least the bedroom is simple so far with everything we really need. For the rest of this week, I'll go back to finishing the kitchen projects and maybe even build a dining table by next weekend. :) I guess we'll have to wait and see.